Picture book writers, start your engines! Next month, when all the NaNoWriMo (National Novel Writing Month) enthusiasts are sweating over their keyboards to produce 50,000 words in 30 days, you, too, can suffer for your art. It’s time for the third official season of writer Tara Lazar’s brain child: Picture Book Idea Month, or PiBoIdMo (which my brain always converts to Pie-BOLD-mo, which then becomes piebald mo, which, oh, never mind). Do you think you can meet the PiBoIdMo challenge and create 30 new picture book ideas in 30 days? Well then, sign up [link added by ShelfTalker] for all the craziness! The concept is to create 30 picture book ideas in 30 days. You don’t have to write a manuscript. The object is to heighten your picture-book-idea-generating senses. Ideas may build upon other ideas and your list of potential stories will grow stronger as the days pass. By the end of the month, you’ll have a file of ideas to help inspire you throughout the year. Those who sign up for Picture Book Idea Month will be eligible for prizes—and oh, are there prizes this year! Signed books, picture book critiques, original art by picture book illustrators, book jewelry, hand-made journals, vintage children’s books, and feedback from one of three literary agents. There’s a terrific list of guest bloggers who will be inspiring participants throughout the month. PiBoIdMo and NaNoWriMo and similar endeavors are delightful and energizing. I think they can help focus and sustain those elusive pinpoints of brilliance and inspiration that creative people live for, and help get procrastinating and/or perfectionist writers our of their own heads and back to work. My writer friend Freeman Ng has a marvelous blog called Haiku Diem, in which he creates a new haiku each day; this project is now going into its second year. That’s inspiring. And my artist friend Kevan Atteberry has been creating a Monster a Day all month long, and delighting his pals on Facebook with them. What I like about PiBoIdMo is that it’s customizable: you can nudge it to suit your needs. Perhaps you want to draft one perfect sentence every day (too ambitious? one sentence that makes you laugh out loud, then, perhaps), or create a new character sketch every day. If you do participate in PiBoIdMo, consider doing so with a nod to this week’s wonderful Proclamation from a group of picture book writers and illustrators exhorting a more widely supported return to high standards, innovation, and excellence in our craft. 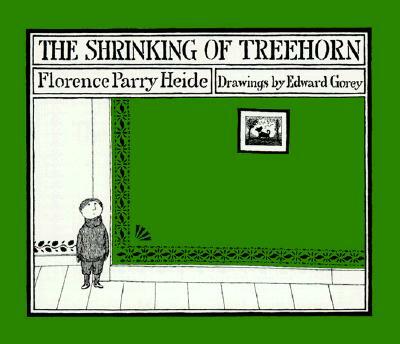 And do so with a warm, appreciative thought for that most innovative, excellent, original and untamed picture-book author, Florence Parry Heide, whose genius mind brought us, among many other titles, the marvelous The Shrinking of Treehorn, illustrated by Edward Gorey. We were very sorry to hear that Ms. Heide passed away this week (the Washington Post has a nice, if brief, write-up here) at the age of 92. She was a writer of economy and sharp wit, and we would all do well to aspire to even a little of her inventive spark. So, come on, folks, get ready, get set, and…. GO! This entry was posted in Uncategorized on October 27, 2011 by Elizabeth Bluemle. I’m eager to sign up, but my efforts have failed numerous times. Any advice about how to make the link work? I keep getting e-mails with a link to confirm, but they lead me to a wordpress page that says I have no pending blogs to follow…Thanks! Jennifer, I have you name on the sign-in page so you’re all set. I’m sorry the WordPress email subscription isn’t working. I’m not sure what to do about that since it’s all automatic on WordPress’s end. But just don’t worry about it…as long as your name is on the sign-up page you’re all set! Thanks! I’m so glad I’m not the only one who reads it as Pie-BOLD-Mo! How wonderful of you to mention the adorable and zany Tara Lazar (I’ve had the pleasure of meeting her and eating dinner with her and she’s a lot of fun) and her brainchild. I participated in last year’s PiBoIdMo and was thrilled to come up with 34 shiny new ideas for picture books. In fact, I still have so many of them to turn into manuscripts that I won’t be participating this year. But good luck to those who are! Thanks, Joann! I’m sorry you’re not joining PiBoIdMo this year but it sounds like you don’t need it! I look forward to seeing you again…maybe NJ-SCBWI next June??? I’d not heard of the PiBoIdMo so I’m glad you wrote about that. I just signed up. I always enjoying reading posts by you and Josie. Thank you. Thank you so much for mentioning PiBoIdMo, Elizabeth. I tend to call it Pie-BOLD-Mo in my head because the “I” looks like an “L”. So let’s all be BOLD this month with our ideas, like the wonderful Ms. Heide! She will be deeply missed.